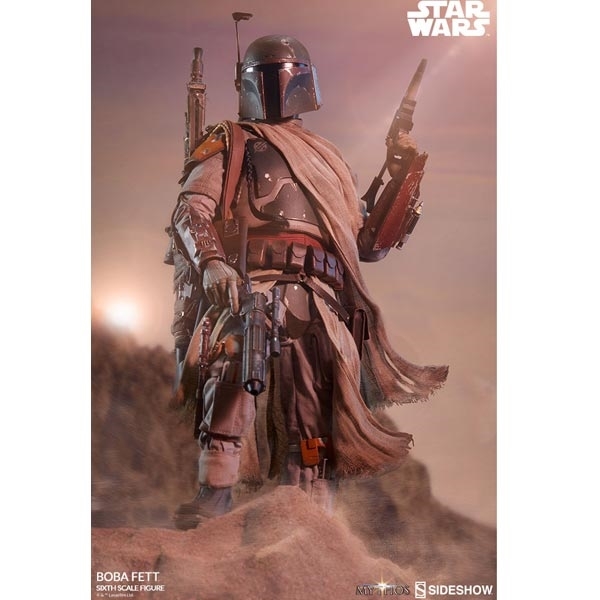 “I take it you have no love of the empire.” Sideshow is excited to unveil the next addition to the Star Wars Collectibles Mythos series, the Boba Fett Sixth Scale Figure. As a collection, Sideshow’s Mythos series are fine art collectibles that allow the collector to imagine what could have been but maybe never was. Myths meant to be initiated by the eye and completed by the mind. The Boba Fett Sixth Scale Figure features uniquely sculpted Mandalorian armor, including his iconic helmet with an articulating rangefinder, a flight suit and vest with body plate armor, knee pads, and weaponized wrist gauntlets, all detailed with distinctive Mythos weathering effects. 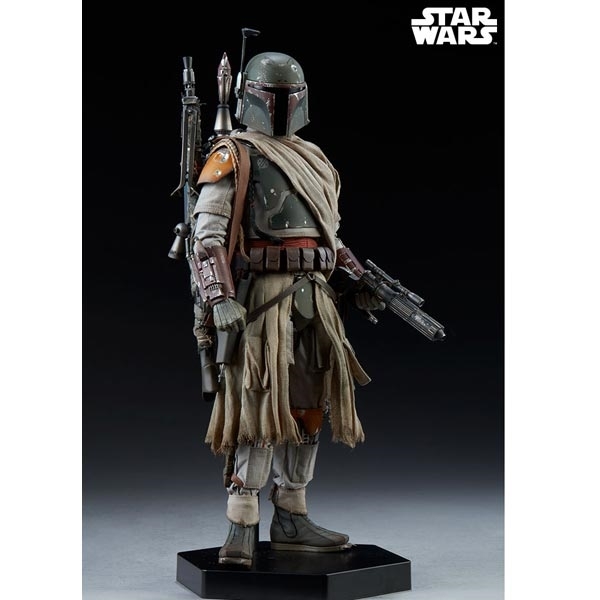 Boba Fett’s unique costume also includes a worn fabric poncho, a kama skirt with utility pouches, ankle spats, and several belts with side and waist pouches. 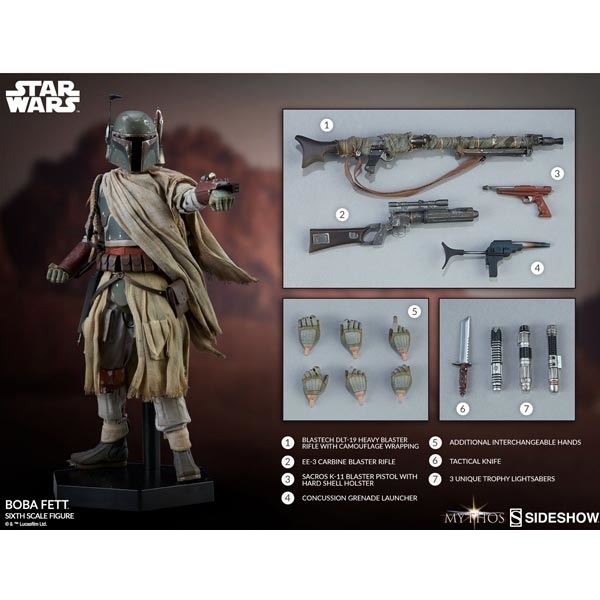 Every bounty hunter needs trophies to prove their skill- Boba Fett comes with three shoulder-mounted synthetic-hair Wookiee braids, and three unique lightsaber hilts taken from his fallen targets. 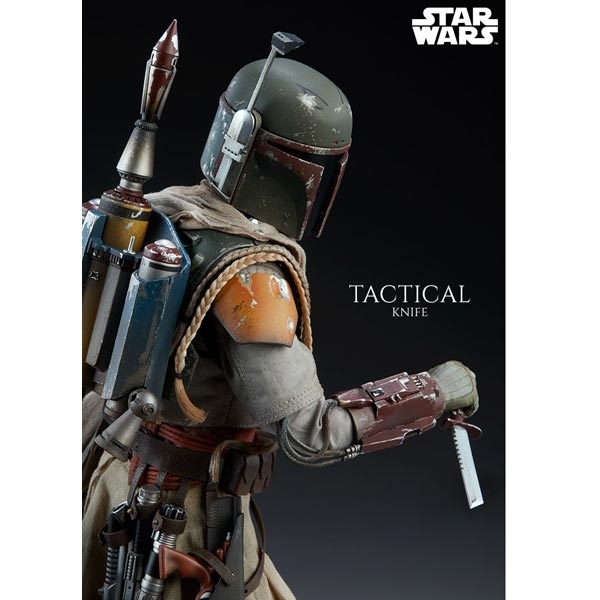 The Boba Fett Sixth Scale Figure includes a removable Z-6 jetpack with articulating rocket boosters, four multi-purpose shin tools, and a tactical knife with an ankle-mounted sheath. He also features an arsenal of firepower, including an EE-3 carbine blaster rifle, a concussion grenade launcher, a BlasTech DLT-19 heavy blaster rifle with camo wrapping, and a Sacros K-11 blaster pistol. The figure comes with eight interchangeable hands, including a pair of fists, a pair of neutral hands, a pair of grip hands, a right trigger hand, and a left rifle support hand.